This fast flow filter removes up to 99.99% of pollutants and contaminants found in drinking water sources, using its proprietary Ionic Adsorption Micron Filtration System. 400+ litre capacity. 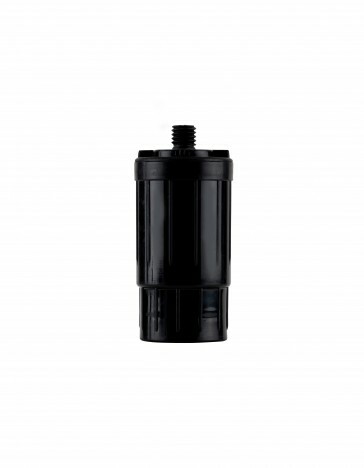 A: This is designed as the replacement filter for the stainless steel filter bottle, but it will also fit the 700ml plastic filter bottle and 800ml Travel Safe filter bottle. Q: Can I remove the plastic filter casing without damaging the filter? A: You can carefully remove the plastic filter cover. It is designed simply to offer additional protection for the filter, but the filter can be used without the cover on. In fact, removing the cover will very slightly improve the flow-rate. Please remember that care should be taken not to knock or damage the filter whenever the cover is not being used, and be sure to remove the cover to check the filter for cracks should you drop the filter and suspect it may be damaged.